PLC - 200V | Kolkata ,India from SD Automation & Control Pvt. Ltd.
Instrumentation tubes & Fittings, Valve Manifolds, Condensate Pot SS / MS / CS. The DT300 “Touché” Intelligent Density Transmitter is an instrument developed for the continuous, online measurement of liquid density and concentration, directly in the industrial process. Its pioneer technology consists of a capacitive type differential pressure sensor coupled to a pair of pressure repeaters immersed in the process. A temperature sensor located between the two pressure repeaters is used to compensate the temperature variations in the process fluid. A dedicated software, by means of an algorithm, calculates the fluid density. Depending on the industrial process, density may be expressed in g/cm3, Kg/m3, lb/ft3, Specific Gravity, Brix degree, Gay-Lussac degree, Baumé degree, Plato degree, INPM degree, API degree, Solids %, Concentration %, etc. Designed for process control applications, these 2-wire transmitters generate a signal proportional to the concentration/density. Digital communication for remote calibration and monitoring is also provided. # Accuracy ±0.0004 g/cm³ (±0.1 °Brix); # Temperature compensation; # Range 0.5 g/cm³ - 5 g/cm³; # Standard industrial and sanitary process connection; # Digital LCD indicator; # Direct density or concentration readout in engineering units; # Suitable for dynamic and static liquids; # Two wire loop powered; # Several different wetted materials; # Single integrated unit without moving parts; # Factory calibration and Self calibration; In field re-calibration:  No standard reference required;  No lab calibration required;  No process shutdown. # Continuous/Self diagnostics; # Weather proof, explosion proof and intrinsically safe; # The control strategy is built from direct instantiation and deletion of function blocks; # Configuration and Parameterization all through open and interoperable configuration tools available in the market, e.g., based on PC or PCMCIA Cards or operations by the local adjustment switches (should be used with a LCD display); # Use of the Analog Input function; # Totally digital; including sensor, electronics and communication; Configurable Local Adjustment (Foundation fieldbusTM and PROFIBUS PA); # Easy firmware upgrade (via Flash Memory Interface) for Foundation fieldbus TM and PROFIBUS PA; # Easy maintenance; # Three technology options: HART®, Foundation fieldbusTM, PROFIBUS PA.
SD Automation & Control Pvt. 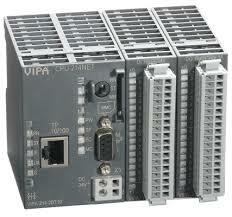 Ltd.
200V is a modular control system for centralized and decentralized applications. Its compactness in combination with the instruction set of a S7-300 CPU makes the system 200V a rock-solid and unique system. Electronet series LCS-02 are capacitance type level switch. Vessel wall & probe forms two electrodes. If vessel is of non conductive material, the probe will be double rod type. The distance between electrode & surface area of electrodes remain unchanged. The variable is the depth of the material being measured which represents the dielectric constant between two electrodes. Air & vacuum have relative dielectric constant as 1 & that of liquids, it is greater than 1. The capacitance of the capacitor therefore depends on how much material lies between the probe & vessel wall i.e. Whether the probe is covered with or free from material. The capacitor changes with change in level of the material & provides switching output at desired preset level. Electronet series CT-100S are Conductivity transmitters used for various industrial applications. It can accept input from conductivity electrode of cell constant 0.01 / 0.1 / 1 & conductivity signal is transmitted in the form of electrical 4 -20 mA signal. The on-line conductivity indication is provided through LCD. Span/Zero adjustments are easily accessible. Electro mag flow transmitter are micro-controller based 2 wire full bore type electromagnetic flow transmitters specially used for various industrial applications. These flow transmitters accurately measure the flow rate of conductive liquids & slurries in closed pipes. Due to its simple & rigid design, the flow transmitter is an obstruction less & maintenance-free instrument in place of conventional mechanical flow measuring device. The use of ‘Pulsed DC’ technology offers highest ability & better measuring accuracy in the form of electrical signal 4-20 mA DC linearly proportional to volumetric flow, The instrument is based on Faraday’s law of electromagnetic induction. A magnetic field is generated by the instrument in the flow tube. The fluid flowing through this magnetic field generates a voltage that is proportional to the flow velocity & corresponding electrical output is provided with respect to ensuring voltage. Professional Panels – extremely powerful Touch Panels with unique features and a very high scalability. Additionally you have the choice whether you want a panel with or without runtime. 300S, powered by SPEED7, makes this system one of the fastest and most powerful μ controller based systems worldwide, programmable with SPEED7 Studio from VIPA. SLIO is a modular and extremely compact control and I/O system. It is universally combinable and deployable with every established VIPA system and nearly all those of other producers.